For dentists placing Class II restorations, Palodent Plus is the new integrated sectional matrix system from DENTSPLY that delivers easy, predictable and accurate contacts using innovative component technology. • Accurate contacts and tight marginal seal - Nickel-Titanium rings for consistent separation force and matrices with a built-in marginal ridge and contact embrasure. Anatomically-shaped ring tines grip low at the gingival margin of both sides of the adjacent teeth and snugly fit to the wedge, as it compresses and flares to assure a tight seal. • Minimised flash and finishing - The tight fit of the ring tines to the wedge and matrix prevents flash to minimise time spent on finishing for a more efficient restorative procedure. placement and removal easy. Based on preference, the ring, matrix, wedge, or WedgeGuard may be placed first. 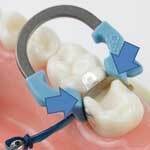 The WedgeGuard becomes a wedge in one simple step and a second wedge can be placed without removing the ring.